Monday morning. Overcast. Dreary white sky. I've been up since 5:30 on account of a goat yelling for milking and grain. It's about 11 and I've reached a natural pause in chores and various jobs and have decided to sit down for a minute and check in with the internets. Idly, I wonder whether Wet Hot American Summer is available for streaming on Netflix so I can put it in the queue. You know, efficiency. It's been on the list (cultural education) and now it belongs in the queue. Ah, yes. Here it is. Wet Hot American Summer is indeed available for streaming. Actually, it's available right this second which is the thing about streaming. And as Benjamin Franklin said, why put something in your queue for tomorrow when . . . I don't recommend Wet Hot American Summer and definitely not on a Monday morning because: sloppy comedy. Also: self respect. When I looked up from the movie it was afternoon and the day was now hopelessly polluted by sloth. Who watches movies on Monday morning? Be quiet. But once a day has been hopelessly polluted by sloth, you might as well just wallow in it. Turns out Fish Tank was also available for streaming and I highly recommend Fish Tank, which is brilliant, though not on a Monday afternoon because: self respect. The kids came home from school and I was lying there watching Fish Tank on the iPad. Whenever they passed through the room I switched it off so they would think I was reading. Streaming movies in the day is like drinking in the day: not as fun as it should be. I'm between cookbooks and during the hiatus have been making dinners from the Food52 Cookbook. It's a great book. Speed and simplicity are valued, but not fetishized. High quality ingredients are valued, but not fetishized. Obscure products are called for, but only occasionally, when they really matter. Everything has been thoroughly vetted and road-tested and the book is right at my natural level, no reaching required. We've liked some Food52 dishes more than others, but the things we've loved have been tremendous: kale quinoa pilaf, lemon posset, chewy sugar cookies, zucchini pancakes. The other night I made the absurdly addictive asparagus which was a huge hit, though I believe it's the pancetta that's absurdly addictive, not the asparagus. But I can't "do" Food52. It's already been done -- at Food52. So what cookbook comes next? Yesterday, I had to pause Wet Hot American Summer to remove a loaf of country wheat bread from the oven and I cut myself a slice while it was still steaming hot. Ten minutes later I had to pause Wet Hot American Summer a second time to run upstairs and cut another slice. This bread has stupendous flavor (from a starter that I let sit for 20 hours) and a hard, hard crust (from baking on a stone and filling the oven with steam.) The recipe comes from a 1999 memoir called Bread and Chocolate by Fran Gage that includes about sixty recipes. Among them: chocolate cherry tart, brioches with goat cheese custard and fruit, ricotta gnocchi, California-style pork tamales. This morning as I ate toast made from Gage's country wheat bread, I realized I had topped it with the super-tart plum jam I made two years ago using the recipe in her book. Every time I eat that jam, I think all jam should be plum. I'm going to do Gage's book as a quick palate cleanser between the olive oil and paprika of Spain and whatever comes next. If the other recipes are half as good as the bread and the plum jam, this will be a very pleasant couple of weeks. On another subject, over the weekend we emasculated Jack Frost. Key words: crushing, tissue, pliers, testes, bloodless, fast, painful. No fun at all. We do love that little goat and hope someone will want him for an impish, neutered, weed-eating pet. I watch Celebrity Ghost stories every afternoon, and this morning I'm going to make french toast at watch Inside the Actors Studio. Sloth. Oh man, I love Celebrity Ghost Stories! I'm down with the sloth. Tipsy, I have an unrelated, stupid question. 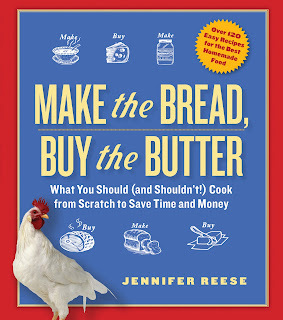 I recently bought Short and Sweet, and now I want to make every single recipe in the book. I've never used a cookbook that measured the ingredients in grams, ml, etc. I know this is really dumb, but how do I go about converting that? Do I need a fancy scale, or English measuring cups, or what? Ei -- Ugh. I know. I had to buy an electronic scale a few years ago to review Michael Ruhlman's RATIO and it was not that cheap and I was unhappy about having to do it. But I now use it ALL the time and am becoming one of those people who actually prefers using the scale as it is more accurate and very easy and uses fewer dishes. My advice would be to just make the investment. I was afraid of that. ha! I guess I'll hold off for a few months, since I'm moving to Italy in August and none of our electronics will work there. Better to just buy one there. Except that I'm dying to get my mouth on a butterscotch banana cake. Patience is not my strong suit. Inquiring minds want to know: who, exactly, castrated Jack Frost? By the way, cheap me, I got your book from the library but now I bought my own copy and friends have done likewise. Love it. Anonymous -- I've seen that lemon cake/bread and it's on the list, given the number of Meyer lemons in the refrigerator. EI -- Now I want to make that cake. Anonymous -- My father held Jack while I did the emasculation. It wasn't a castration. I didn't cut or remove anything, just crushed (I hope) the vessels that connect his manhood with the rest of his body. I'm glad you liked my book. Thank you! I've seen Wet Hot American Summer, albeit not on a Monday (not judging, promise). I particularly liked the scene when Paul Rudd moped around the cafeteria when Garafalo (sp?) made him pick up his plates. Hysterical. My husband and I do that move all the time. Paul Rudd was incredible. He had this facial expression that perfectly captured the snotty, hot teenaged jerk circa 1981. Batteries! Brilliant! Hmmm...maybe I should have spent the amazon gift card my brother sent me for my bday to buy a scale instead of four used cookbooks. Ohhhh well. What does that pie say? Lazy Lenon? 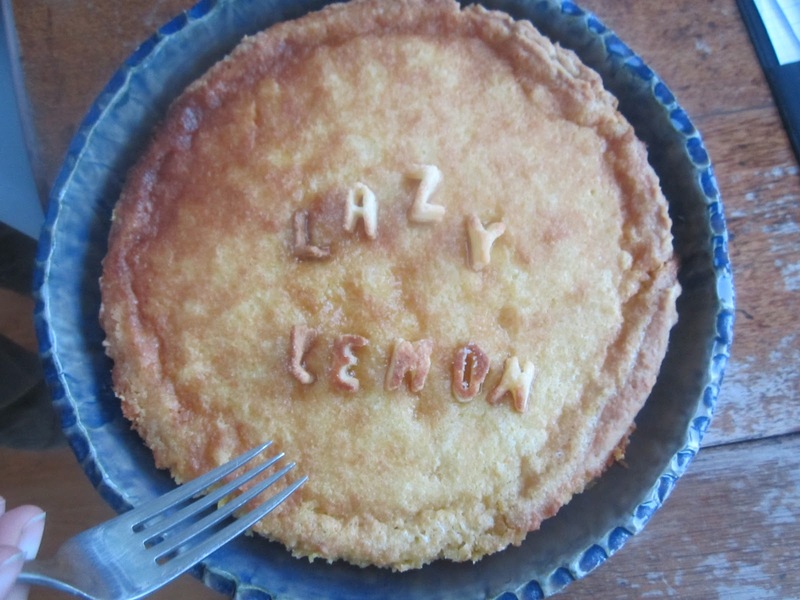 It was supposed to say Lazy Lemon but the pastry letters were so warped I didn't notice I got them wrong until I took the picture. Somehow the Food 52 cookbook never appeals to me. The recipes just seem so random. But I keep it on the shelf since you write about it so convincingly, and maybe now I'll actually try it out. Laurie -- the organization is awkward and feels random. I want to see all the desserts in one place, all the breakfast foods in one place. Very hard to browse through this cookbook. Moreover, the recipes ARE a grab bag. But they're really, really good recipes. I bought a new scale at Target--Oxo brand. I love it. It changes from metric to imperial, and the readout piece pulls out on a string so you can see it under big bowls.